Michael Frayn’s Skios is both fun and funny, an entertaining farce about mistaken identity at a Fred Toppler Foundation conference—“Innovation and Governance: The Promise of Scientometrics”—for a bunch of schmoozing jetsetters and would-be intellectuals who gather on a fictional Greek island. Skios tells the story of two Dr. Norman Wilfreds and the silly havoc they wreak on themselves and the people around them. The passport-proven Norman Wilfred is scheduled to lecture at the conference about the management of science… but ends up at a distant house on Skios instead of the lavish conference site after being mistaken for one Oliver Fox. The ersatz Norman Wilfred, whose real name is, yes, Oliver Fox, is coming to Skios for a fling but decides to become Dr. Wilfred when he sees a woman holding a Norman Wilfred sign at the airport and decides “that would have been a good name to have.” Fox-Wilfred also sees that Nikki Hook, the woman greeting him, “plainly wanted him to be Dr. Wilfred.” Fox-Wilfred isn’t one to disappoint. There are many layers of humor lurking in Skios, from the repetition of identity-based gags—like Spiros and Stavros, brothers and taxi drivers, who think real-Wilfred must be “Phoksoliva,” which real-Wilfred thinks must be a Greek expression—to a receptionist answering the phone by saying “How my dreck your call?” And then there’s satire involving empty-headed conference attendees, who are all too eager to believe that Fox-Wilfred is real-Wilfred. Even if they’ve met him in the past. Identity in Skios is all about belief and labels, that people fit the labels they present; this plays nicely on contemporary thought that something will happen if you believe in it enough. Perhaps what’s most telling on Skios is that the person at the conference who most pesters Fox-Wilfred, asking him real scientific questions, is shunted aside over and over because he’s inconvenient: maintaining the illusion of Fox-Wilfred is more comfortable. Of course the illusion is also entertaining and suspenseful for the reader, as when Fox-Wilfred comes up with an absurd and messy magician-like act with coffee cups in an attempt to evade answering the questions. Frayn ends the novel with far more of a semiotic bang than I’d expected. He sets it off with a careless action (involving sweets) that spurs an utterance—an English word that has multiple meanings—that prompts an inappropriate reaction. This misunderstanding has much, much worse consequences than the Fox-Wilfred matter but Frayn still manages to end the book on a humorous note, with Mrs. Toppler thanking her conference guests. Everything is only what you say it is. Skios, by the way, was long-listed for the Booker Prize last week. Skios is listed on the Macmillan Web site here, with a brief excerpt. Up Next: Andreï Makine’s The Life of an Unknown Man. Then G. Willow Wilson’s Alif the Unseen. Disclaimers: I received a review copy of Skios from the publisher, Henry Holt. Thank you! Riikka Pulkkinen’s True, which I read in Lola M. Roger’s translation from the Finnish original Totta, is a novel about family, death, and dying that tells the story of three generations. Though it’s the grandmother, Elsa, who is dying in the present day, Pulkkinen tells much of the family’s collective story through an affair in the 1960s between Martti, Elsa’s husband, and Eeva, the nanny for their daughter Eleonoora. The situations in True—a torrid affair with the nanny while Elsa is away on business—sound trite and soap opera-ish, but Pulkkinen offers a new angle by letting Martti and Elsa’s granddaughter, Anna, imagine the affair. This isn’t a stretch for Anna: she and Martti have a long-standing habit of looking at strangers and inventing life stories for them. Anna combines imagination with her own life, projecting her own pain, left over from her relationship with a past boyfriend’s young daughter, onto Martti and Eeva’s story, thinking Eeva would also suffer from being separated from Eleonoora. No one will admit it but all of us are actually more interested in the lake and the sauna and the half of a blueberry pie on the table than we are in the fact that reality is being created at this very moment in offices and meeting rooms and on speakers’ platforms and who knows maybe underground in the kinds of groups whose names have only just been thought up. Pulkkinen refers to other Finnish sweets, including some of my favorites: breads with cardamom, which my mother used to bake using my Finnish grandmother’s recipe, get several mentions as do candies from Fazer, which I used to buy in airports on my way to and from Moscow. I suspect they draw on Finnish readers’ senses and—more importantly—memories even more than they draw on mine. In Rogers’s translation, the narrative voices of True feel neutral and, considering the emotional subject matter, almost flat, as they describe landscapes, family relationships, and even Elsa’s death, which the reader knows must come. But Rogers’s tone felt true to me: it prevented the novel from becoming maudlin, and it fit nicely with True’s Finnish settings, where characters endure, with stoicism, hot saunas, cold swimming, and all sorts of emotional pain and distance. I think it’s the combination of stylistics, Finnish motifs, and, of course, stereotypical elements of stories about family—meaning everything from the book’s narrative tone to the birds, the sweets, the lake, the rotting boards in the sauna, the love of ice cream, and even the closet holding Eeva’s old dress—that hold True together, making an old story feel worthy of retelling, with, of course, variations. Disclaimers: I received a review copy of True at BookExpoAmerica from Other Press, thank you! I enjoyed speaking about Russian literature in translation with Other Press during BEA. More on disclosures: here. Up Next: Michael Frayn’s Skios, which I enjoyed very much. 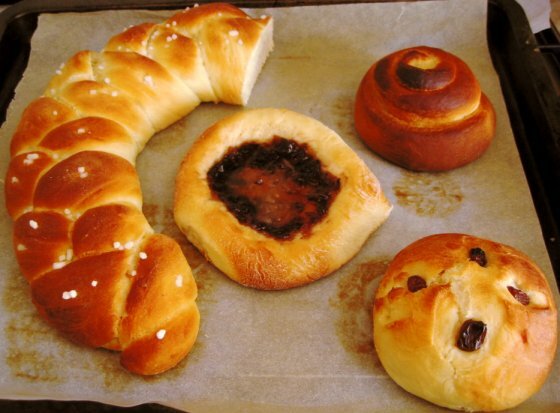 Image credit: Photo of Finnish breads from Mikalaari, via Wikipedia. The Last Policeman is a new type of mashup novel for writer Ben H. Winters, co-author of such titles as Android Karenina and Sense and Sensibility and Sea Monsters: in The Last Policeman, Winters sets a murder mystery in pre-apocalyptic Concord, New Hampshire, creating a suspenseful and thoughtful combination of crime and natural disaster that asks refreshingly everyday existential questions of everyday people. Winters’s narrator is Hank Palace, a police detective who insists on investigating an apparent suicide—the dead man is a “hanger” whose body is found in a McDonald’s men’s room—because his instincts tell him something isn’t right. “A man is dead,” he says. Of course people die all the time, hangers are common in Concord, and everybody in The Last Policeman is going to die in fairly short order. They’re counting down the months until an asteroid known as Maia will hit. For me, the acceleration of everyone’s demise—and the reactions it produces—is the source of the appeal of a full-on literary natural disaster like Maia. An asteroid is the ultimate unexpected guest who walks in on a static dinner party (or state capital) and changes everything. But that’s how it works: no matter what the odds of a given event, that one-in-whatever-it-is has to come in at some point or it wouldn’t be a one-in-whatever chance. It would be zero. Still, the conscientious detective is obliged to examine the question of motive in a new light, to place it within the matrix of our present unusual circumstance. The end of the world changes everything, from a law-enforcement perspective. The Last Policeman, which will be released July 10, 2012, is the first novel in a planned trilogy. Disclaimers & disclosures: I received a review copy of The Last Policeman from Quirk Books, from Eric Smith, whom I’ve enjoyed seeing at BookExpo America, and who’s a friend on Facebook. Thank you! Up Next: Riikka Pulkkinen’s True... I’m glad to be back to my usual reading routine after a busy spring!